Intelligent Credit Scoring presents a business-oriented process for the development and implementation of risk prediction scorecards. The credit scorecard is a powerful tool for measuring the risk of individual borrowers, gauging overall risk exposure and developing analytically driven, risk-adjusted strategies for existing customers. In the past 10 years, hundreds of banks worldwide have brought the process of developing credit scoring models in-house, while ‘credit scores' have become a frequent topic of conversation in many countries where bureau scores are used broadly. In the United States, the ‘FICO' and ‘Vantage' scores continue to be discussed by borrowers hoping to get a better deal from the banks. While knowledge of the statistical processes around building credit scorecards is common, the business context and intelligence that allows you to build better, more robust, and ultimately more intelligent, scorecards is not. 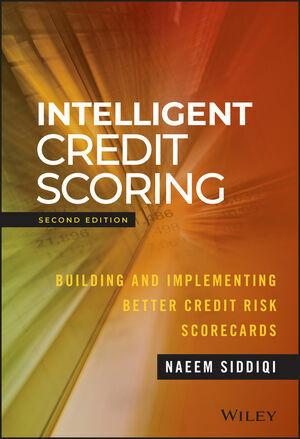 As the follow-up to Credit Risk Scorecards, this updated second edition includes new detailed examples, new real-world stories, new diagrams, deeper discussion on topics including WOE curves, the latest trends that expand scorecard functionality and new in-depth analyses in every chapter. Expanded coverage includes new chapters on defining infrastructure for in-house credit scoring, validation, governance, and Big Data. Credit scoring is now a very common tool used by banks, Telcos, and others around the world for loan origination, decisioning, credit limit management, collections management, cross selling, and many other decisions. Intelligent Credit Scoring helps you organise resources, streamline processes, and build more intelligent scorecards that will help achieve better results. NAEEM SIDDIQI is the Director of Credit Scoring and Decisioning with SAS® Institute. He has more than twenty years of experience in credit risk management, both as a consultant and as a user at financial institutions. He played a key role in developing SAS® Credit Scoring and continues to provide worldwide support for the initiative.